Bets Staging’s Award: “Toni Erdmann” (Maren Ade/Ger.-Austria/2015/162’). “Cineuropa” ‘s Award: “Pikadero” (Ben Sharrock/Spain-UK/2015/97’). “UPS” ‘s Award from the Teenagers’ Jury: “Suntan” (Argyris Papadimitropoulos/Greece- UK/2016/104’). “RTBF TV” ‘s Award for the Best Film: “Toni Erdmann” (Maren Ade/Ger.-Austria/ 2015/162’). “Be TV” ‘s Award for the Best Film: “The Olive Tree” (Iciar Bollain/Spain-Ger./2015/ 98’). Audience and “Brussels Airlines” Award : “The Olive Tree” (Iciar Bollain/Spain-Ger. /2015/98’). Award from the “UPCB/UBPF ‘s Jury”: “De Broers van Bommel” (Laurens Jans/Bel./2015/25′). So, we can see that the great 14th. “Brussels Film Festival” ‘s winner is “Toni Erdmann”, realised by Maren Ade, wich received not less than 3 Awards: the “Golden Iris Award”, the “RTBF TV” ‘s Award for the Best Film and the Bets Staging’s Award. Receiving the Audience Award, “The Olive Tree”, realised by Iciar Bollain, also received the “Be TV” ‘s Award for the Best Film. Out of 12 features being in competition, 7 received, at least, one Award. Other winner is the Greek cinema. Indeed, this year 2 Greek films received one Award: “Suntan”, realised by Argyris Papadimitropoulos (“UPS” ‘s Award from the Teenagers’ Jury) and “Blind Sun”, realised by Joyce Nashawati (Best Photography’s Award for Giorgos Aravanatis). Honour to the Spanish cinema, with 4 Awards gived to 3 films in competition: “The Olive Tree”, realised by Iciar Bollain (Audience Award and “Be TV” ‘s Award for the Best Film), “Callback”, realised by Carles Torras (Award of the Jury), and “Pikadero”, realised by Ben Sharrock (“Cineuropa” ‘s Award), to help us to remember that, a few years ago, one “Spanish ans Latin American Film Festival” was also organized in “Flagey”. So, thanks to the “Brussels Film Festival” to give the opportunity to the Spanish Cinema to be seen by a large audience. Now, waiting for the 11th. 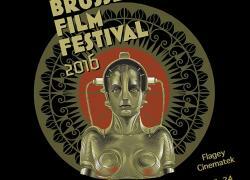 edition of this Festival, in 2017, Ivan Corbisier, leading the organization since 7 years, liked to tell us that he was satisfied to see that 30.000 people came to the “BRFF” this year, not only for the films but also for some conferences, workshops and concerts. Also, for the first time, there was a great event at the “Théâtre 140“, wich was sold out, with Guy Bedos on stage, as well as his friends Jean-Paul Belmondo, Michel Boujenah, Fabrizio Rongione and Pierre Kroll, without to forget his daughter Victoria Bedos.